Last year's third edition of Cambodia's indie film and video festival CamboFest revived the Royal, a French colonial-era cinema that had stood dormant in the southern Cambodia province of Kampot for decades. You can read more about that adventure on the CamboFest blog. Turns out the Royal is one of the three surviving colonial-era cinemas in Kampot, which was a major destination under French rule, due to its proximity to the Bokor Mountain casino resort and hill station (now a perpetually fogged-in ghost town that's been the setting for such films as Matt Dillon's City of Ghosts and the South Korean war movie Taegukgi). The colonial-era seaside spot of Kep is also nearby. In addition to the Royal, Kampot has the Maraka and another old cinema, just recently rediscovered by the CamboFest team. Next year's CamboFest, set for March 1 to 9, 2011 in Kampot, Cambodia, might be held in this place, the name of which is as of yet unknown or unrevealed. There's a phone-cam video of the old cinema at YouTube, and embedded below. Maybe turn down the sound a bit before you hit play. It looks pretty good actually, for what it is and knowing what all Cambodia has gone through. 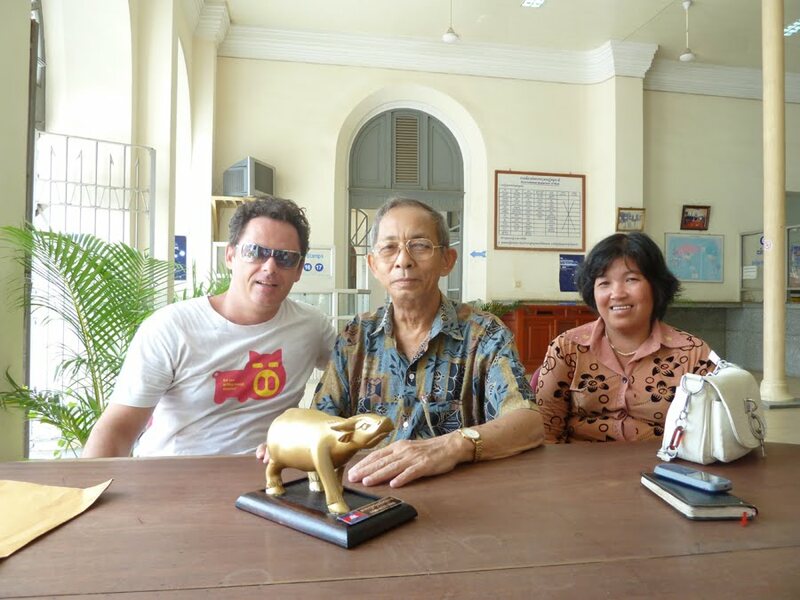 Also recently, CamboFest presented its Grabay Meas (Golden Water Buffalo) trophy to Cambodian filmmaker Yvon Hem for his Shadow of Darkness, which screened at CamboFest 3.0. According to the CamboFest blog, the "trophies from last year were delayed, in part, due to the interference by Phnom-Penh based foreign movie pirates". Yes, part of their adventure last year involved some mean-spirited person who placed a notice on the events page of a Phnom Penh English-language daily newspaper, saying last year's festival had been canceled when in fact it hadn't. It was part of a systematic campaign by rival Westerner-run arts organizations that also included hoax e-mails and blocked usernames on Web bulletin boards. Yvon Hem has meanwhile been attached as co-writer of Freedom Deal, a Vietnam War drama that's in development by CamboFest producers Camerado and director Jason Rosette. Jason's the guy who also started the bang-up Bangkok IndieFest, held earlier this year. Is the first international film festival in Cambodia since the Khmer Rouge era, now in our 4th year and inspiring new festival efforts to join our mission. Is a rare example of strong IP (Intellectual Property) activism in the movie sector in Cambodia, by seeking and securing written permissions for every single movie. Seeks and restores to basic functional condition vintage cinemas and other venues that can serve as cinemas, in a country which is lacking motion picture infrastructure. Is grass-roots, volunteer driven, and private sector (though with tax-deductible fiscal sponsorship through the US-based Media Alliance). Is an absolutely unique festival event taking place under 'extreme' and challenging conditions in the developing world. Consider checking out the CamboFest Facebook page to find out more.